Wildflower Turf Ltd uses its unique ‘soil-less’ system to produce turf that is grown to order. The customer chooses their own seed mix (seeds can be supplied by the customer) and within 12 weeks (depending on time of season), the bespoke turf is ready for delivery. 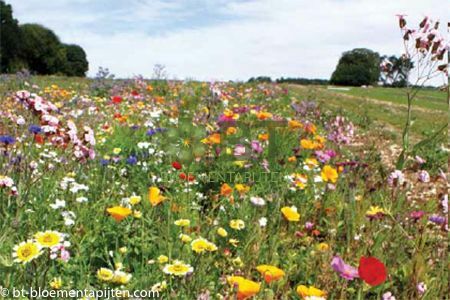 Wildflower Turf Ltd uses its extensive experience to work closely with the customer to ensure a suitable mix is chosen to provide the required results. Wildflower Turf grown to order. Geographical region requiring a native, local provenance seed mix, Aesthetic appeal – specific colours, Regulatory requirements (e.g. BREEAM), Wet, dry, shaded or site specific requirements e.g. soil type.